Heat the oil in a large heavy based oven-proof casserole dish. Add zucchini & capsicum and sauté until soft and fragrant. Add garlic, chillies, rice & paprika and cook for another minute. Add tomatoes, beans (include the spring water with the beans) & water. Add a good grinding of black pepper. Stir to combine the ingredients then cover and place in a preheated oven at 180ºC/350ºF. Bake for half an hour, then remove lid, and continue cooking for ½ hour. Stir the casserole then cook for a further ½ – ¾ hour, until the rice is tender. Season to taste then sprinkle with mixed cheeses and serve. Preheat crockpot or slow cooker on HIGH while preparing the ingredients. Place all ingredients except the salt in the crockpot. Cook on HIGH for about 3-4 hours, checking after 3 hours to see if the beans are tender. Cooking times are approximate as all crockpots cook differently. Once beans are cooked, season then allow to cool in the cooking liquid. Freeze in 1 ½ cup portions (freeze with the cooking liquid). Yeilds about 5 cups cooked beans. 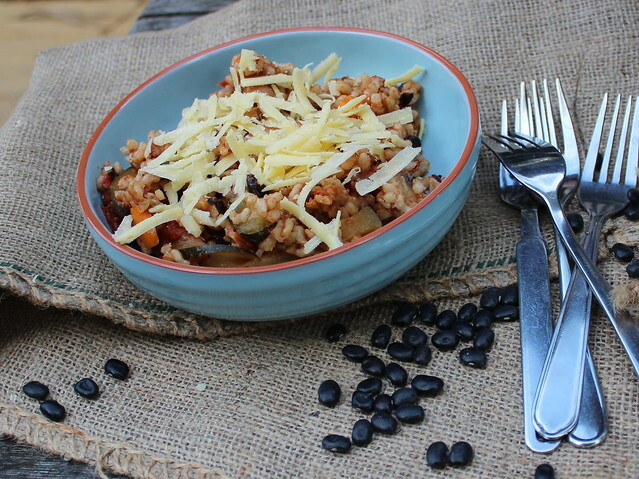 This entry was posted in Savour, Summer and tagged black beans, brown rice, marrow, Savour, summer casserole by Jo Dohrman. Bookmark the permalink.